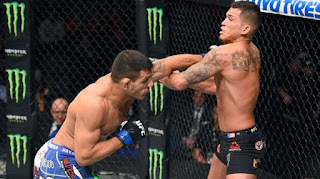 A large amount of Dos Anjos’ success as a fighter is the volume of strikes he throws; this allows him to constantly put his opponent under duress, as most fighters’ first instinct is to get away and create space. This allows him to establish his forward pressure, which allows him to physically and mentally wear down his opponents. The best way to deal with his volume is not to allow it to get established, which means Lawler needs to counter aggressively. If he makes Dos Anjos pay a heavy price for the shots he throws, it will either force him to hesitate for fear of what is coming back, force him to slow due to the large amount of punishment he has taken, or better yet, push him back. The best time to land on an opponent is when your opponent is on the attack, as fighters are never more vulnerable than when they are asserting themselves offensively. If Lawler lets Dos Anjos get going, he can calm him down by exchanging with him. Another element of Dos Anjos’ success at lightweight was his durability. Although he is a defensively sound fighter, RDA sacrificed his defensive responsibility to apply pressure and use volume. In layman’s terms, his need to move forward resulted in him getting hit a lot, which is ironic because when he hasn’t been able to press forward furiously, he has gotten hit even more. Nonetheless, the fact of the matter is Dos Anjos isn’t a big welterweight, which lends credence to the idea that he may not be able to absorb punishment to the same extent that he was able to previously. The body will be there all day and night, Lawler is one of the best body punchers in mixed martial arts history, and it would behoove him to punch holes in Dos Anjos’ gas tank and to pile up punishment. This will limit RDA’s aggression and force his activity to taper off. Rafael Dos Anjos is not as accomplished as Johny Hendricks or Josh Koscheck regarding takedowns, but he has more times than not been able to get a wide array of high caliber wrestling- and grappling-based fighters to the ground. Once there, he goes to work from top position, threatening with submissions or beating the elite status out of opponents. Lawler doesn’t want to allow takedown attempts to be used as a weapon to set up strikes, nor does he want to be on the bottom with Dos Anjos setting up shop to work. To limit both things he must punish any and all takedown attempts. Takedown attempts are a big drain on energy, but they also present a safe haven for fighters who have tired and want to control an opponent, or at least get a break from striking exchanges via the threat of being on the ground. 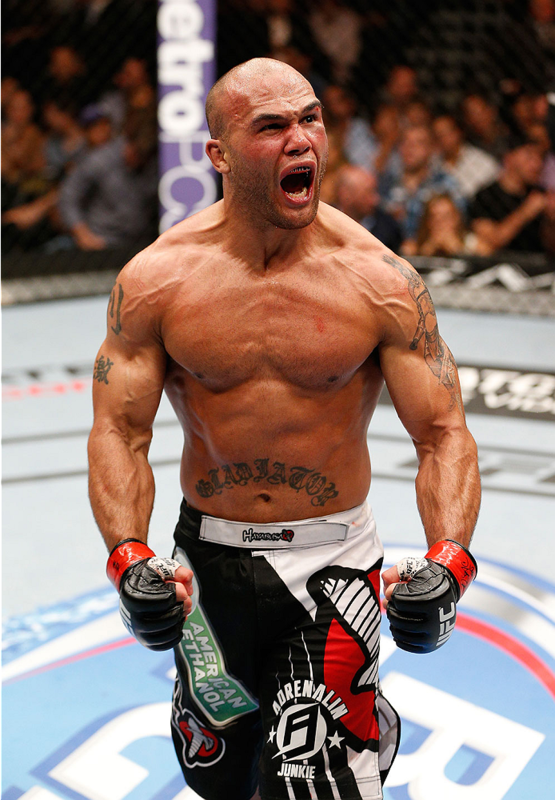 Lawler needs to take both options away and force Dos Anjos into the fight he wants, which is a firefight. He must make RDA pay, so that as his energy wanes, he accrues more damage, and he slows even more as a result of the combination of the two. This will also take away some of Dos Anjos’ forward pressure and expose some of his physical and technical limitations on the feet. There are questions regarding Lawler’s durability, as he was smoked by Woodley and has had a career of fights filled with back and forth exchanges with some of the heaviest hitters in MMA; at some point you have to be concerned that his chin will fail him completely. Dos Anjos is a punishing striker and a high volume striker -- as good as Lawler’s defense is, he has lost a step and he can’t lean on that or his durability exclusively. The best way to limit Dos Anjos’ ability to use either one of those qualities is to establish his jab -- it will disrupt RDA’s footwork, act as a line of defense for Lawler, and set up power shots. When Lawler has used a consistent, busy jab, he has been a lot harder to hit, take down, pressure, or use work rate to tire. Against a smaller but quicker and busier opponent, the jab is a must to avoid the danger zones. Robbie Lawler’s work in the clinch can be devastatingly effective, and Rafael Dos Anjos, for all his physicality, strength, and activity, isn’t the bigger, stronger or more powerful fighter. Getting Dos Anjos in the clinch allows Lawler to wear him down with extended grappling exchanges; it also allows him to pile on punishment and break down Dos Anjos through shots to the body. Most importantly, it allows Lawler to get his hands on Dos Anjos and move him around the cage, back him up, or trap him on the cage, where Dos Anjos’ effectiveness and efficiency drops off tremendously. Rafael Dos Anjos isn’t the greatest takedown artist in mixed martial arts, but he does his best work against the cage. Lawler shouldn’t let Dos Anjos force him against the cage where he can excel. Even when he doesn’t get those takedowns, he controls opponents against the cage, sapping their explosiveness, draining athleticism, and limiting their opportunities to get off offensively (i.e. win rounds). And on the occasion that he gets Lawler down, Dos Anjos is a beast when he uses the fence to control and maintain position on the ground when he has top control. Lawler can get into a boxing mode where he uses kicks sparingly; lucky for him, his explosiveness, boxing acumen (def/off/counters), and power are so good he can get away with that. But when facing a fighter who will use the full tool set and attack at multiple ranges, he cannot afford to concede range or limit the options he has offensively. If that happens, it would allow RDA to set the pace, throw the volume, and tax the defense/durability of The “Ruthless” One. Lawler needs to be a threat at all three levels -- usually he will key in on two (boxing/clinch), but the kicking range also needs to be a factor, as it will provide a line of defense for him and extend/diversify his offense. Lawler is known for taking rounds off. Historically he will follow a dominant round with a round where he lets an opponent get back into a fight, if not win the fight as a result. When Dos Anjos is allowed opportunities to work, he works, and the difference between Dos Anjos when he can assert control (Pettis, Diaz, Henderson) and fights that he hasn’t been able to assert himself (Ferguson, Alvarez, Stephens) is markedly noticeable. 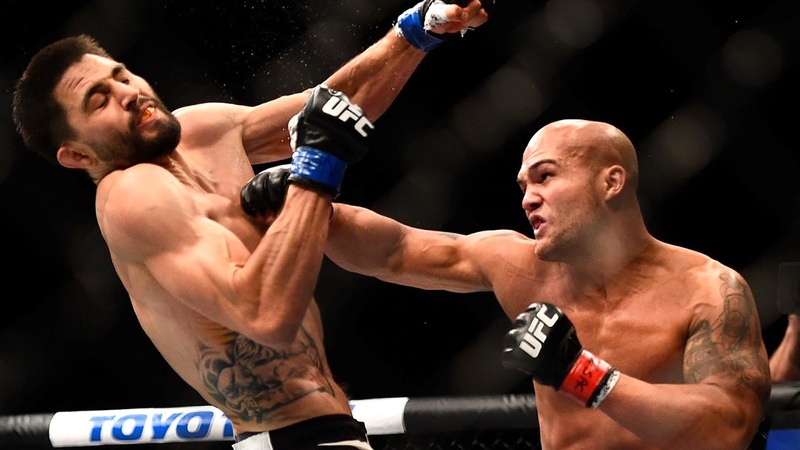 If Lawler lets RDA get started early -- something we have seen from him in wins against Hendricks, Cerrone, and Carlos Condit, and more recently in the devastating loss to Woodley -- he is fully capable of outworking and overwhelming Lawler in spots or over the length of the fight. Rafael Dos Anjos is best on his front foot cutting off the cage, moving forward and strafing his opponents with a variety of strikes to the head and body, pinning them on the cage and transitioning into takedowns and takedown attempts. When he is pushed back or forced to be defensive, not only is he much more hittable, as mentioned earlier, but he is much more beatable. In fights against Eddie Alvarez, Tony Ferguson, and Jeremy Stephens, Dos Anjos was hurt, forced backwards, and was either on the business end of a severe beating or stopped in spectacular fashion. Lawler is bigger, stronger, and a more explosive striker, not to mention he is the better all-round striker as well; he is fully capable of taking advantage of RDA if and when he pushes him back. When moving forward, his pace and volume is highlighted, and any shortcomings regarding his technical striking or wrestling are masked with aggression and deft footwork. When he isn’t moving forward, his defense is exposed and his footwork is nowhere near as crisp or measured. So Lawler shouldn’t focus exclusively on getting away from the pressure via movement and footwork, he should mix between that and asserting his own pressure and volume to take the play away and back RDA up. A lot is on the line in this fight for Robbie Lawler. He is maybe a fight or two away from a title shot, a loss would damage his case dramatically, and Rafael Dos Anjos is completely capable of setting a pace and distributing a level of punishment that could take Lawler out of the running for that number one contender’s spot. I believe that if he can execute these concepts and strategies, as well as limit RDA from applying his own, he will win, and do so in impressive fashion.